Chris on the Right of the picture with his pass certificate who is a fellow work colleague at Park Lane College Keighley. Chris is a lecturer in Electrical Installation and has been spending lunch times and the odd couple of spare hours with Louise and myself over the last two months. Louise is a registered Examination officer for the Radio Society of Great Britain (RSGB). I am RSGB registered as a Foundation Licence instructor. Chris has been undergoing Foundation Licence training comprising of practical and theory lessons as well as self study. On Friday the 15th of December Chris sat the Foundation Licence Exam successfully gaining a Pass result. Chris has now applied for his Licence and will be operating his Yaesu ft-847 in the next few days. I am looking forward to working him on some of the bands. If you are thinking about becoming a Licenced radio ham, there should be a local club or School/College that might be able to help. More info on this at RSGB Or ARRL or if you are in other Countries Google will tell you which radio organisation is for you. Good Luck. 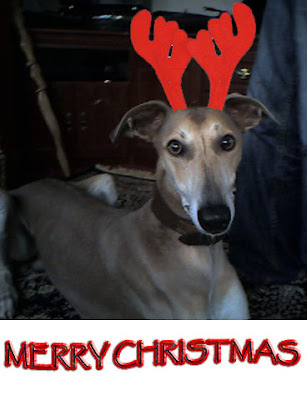 I might get him to try some Antenna Antlers next!. This week was my YL Louise's birthday, I had arranged a short break in Cumbria which we thoroughly enjoyed. We were based at Barrow-In-Furness in the South West of Cumbria and we found the town very interesting with all of its engineering history, Submarines and historic Port. The locals were very friendly and there were some interesting Islands that we visited where I got to make one or two nice QSOs. Here is a video of some of the radio contacts I managed to make during our stay in Cumbria and the Lake District. I decided to do this as some of you guys have been asking me to make some new Youtube videos, so thanks for all the emails and I hope this is OK!